I have now completed three novels set in Egypt and am approximately two-thirds of the way through the fourth. My central character, Merry, is a tourist to Egypt and starts her series of madcap adventures in Carter’s Conundrums while staying at the Jolie Ville hotel, which is situated on Kings Island, just outside Luxor. I’ve been lucky enough to stay at the delightful Joilie Ville twice, in 2009 and 2011. The sunsets looking across the Nile are the most spectacular I’ve seen anywhere in the world. Merry also gets the chance to stay in two of Egypt’s finest old hotels – both world class – both dating from Victorian times. The first is the Mena House, once a Khedive hunting lodge built at Giza, a stone’s throw from the foot of the pyramid plateau. 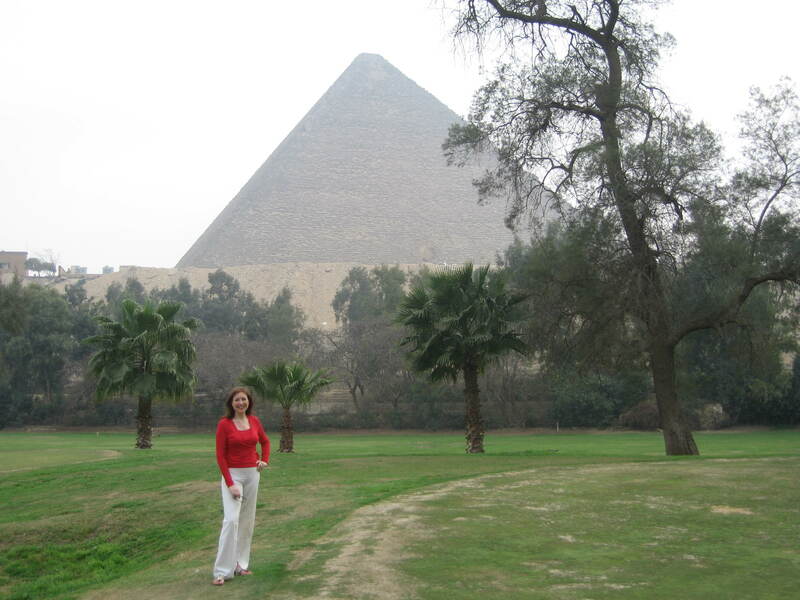 Here’s a snap of me taken in 2008 in the Mena House garden, with the pyramids in the background. It was a hazy day, but you get the general idea of how close they are. 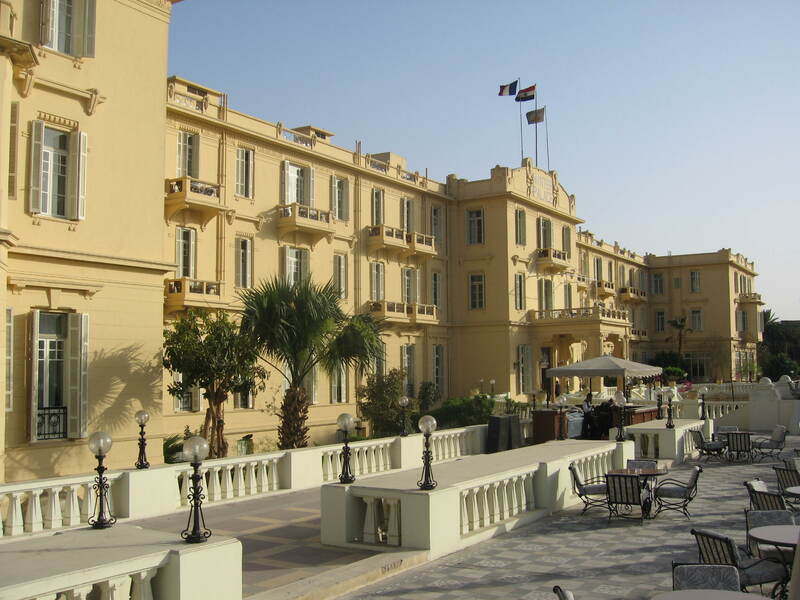 The second of these grand Victorian hostelries is the impressive Winter Palace in Luxor. This is where Lord Carnarvon stayed during the heady days of the discovery of Tutankhamun’s tomb by his excavator, Howard Carter. I don’t imagine it’s changed much since then. It makes a wonderful setting for a novel. I’m also setting chunks of my latest novel, Farouk’s Fancies there – to be published this summer. It’s no coincidence that King Farouk, the last sovereign of Egypt – who was deposed in the 1950’s an exiled to Europe – once used The Winter Palace as his home in Luxor. While Carter’s Conundrums and Tutankhamun’s Triumph are both set at the Jolie Ville hotel, the third book, Hatshepsut’s Hideaway, takes Merry on a Nile cruise from Luxor to Aswan and back for her latest adventure. I chose as my setting the wonderful steamship SS Misr, which dates from 1918 and was lovingly restored by Jules Verne. 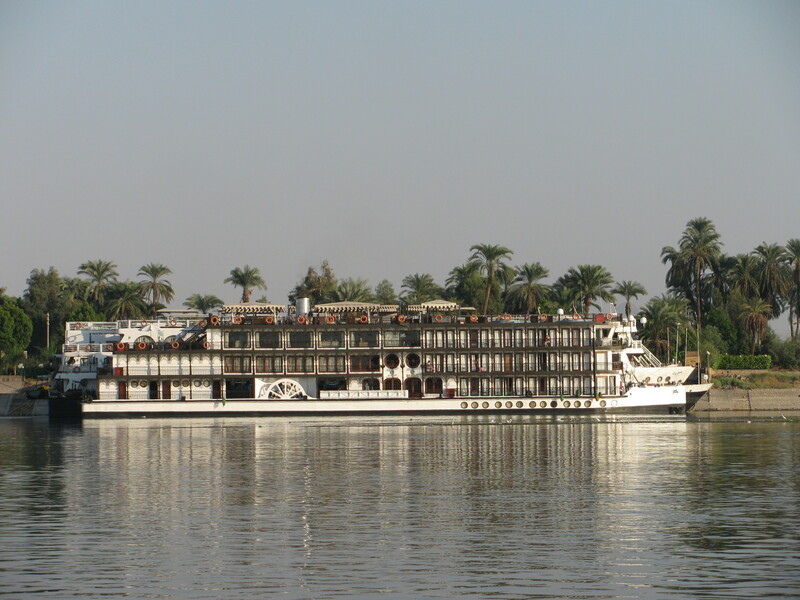 SS Misr was also once owned by King Farouk, who hosted lavish parties on board. 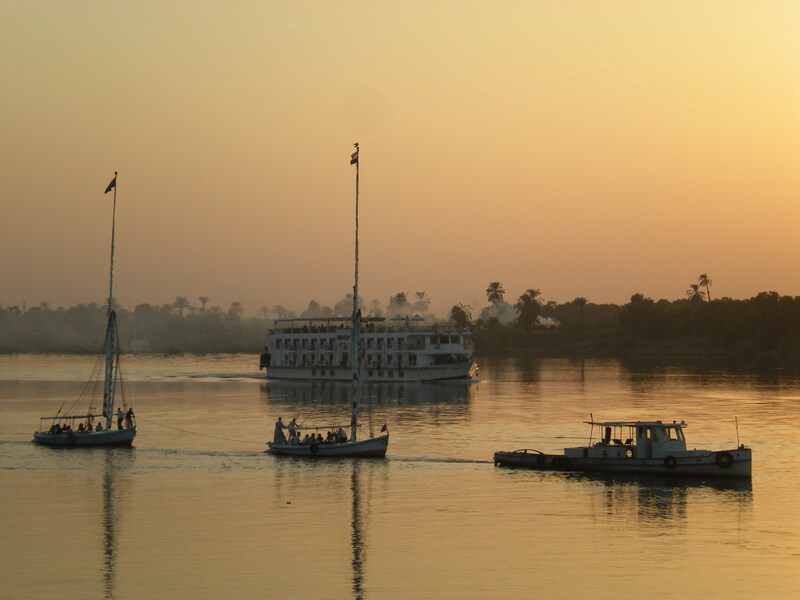 I took a Nile cruise on the Misr in 2008 -a superb trip. 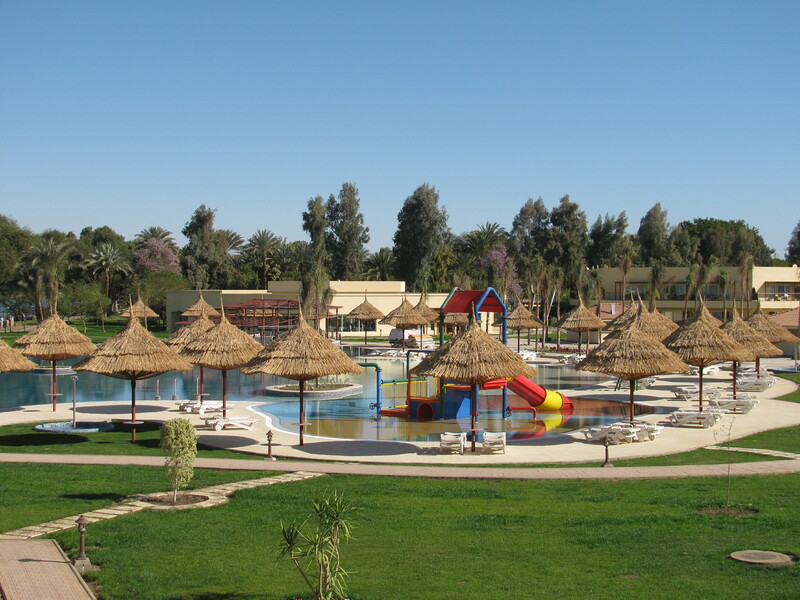 I f you’re travelling to Egypt – and I heartily recommend it despite the political situation – you’re spoilt for choice for wonderful places to stay. My personal favourite has to be The Jolie Ville. 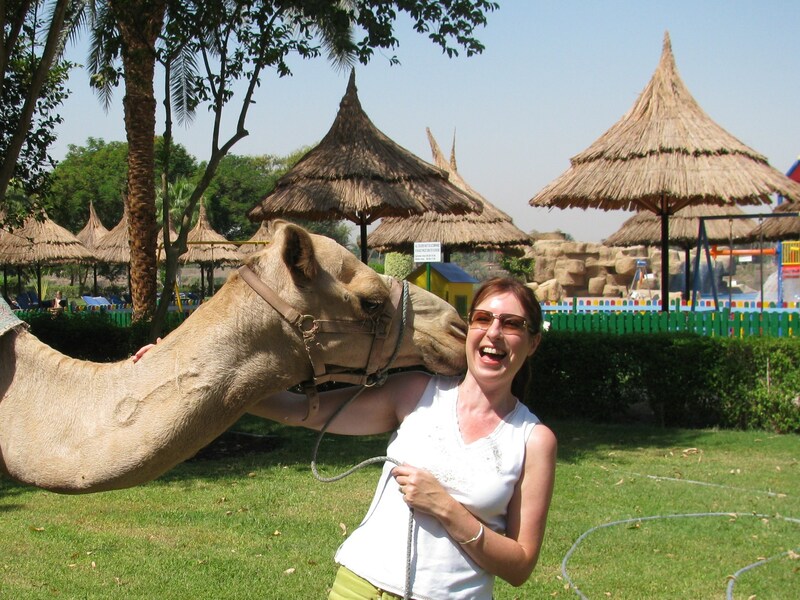 How can you beat a hotel that comes complete with its own star attraction – Ramses the camel offering rides to all and sundry? 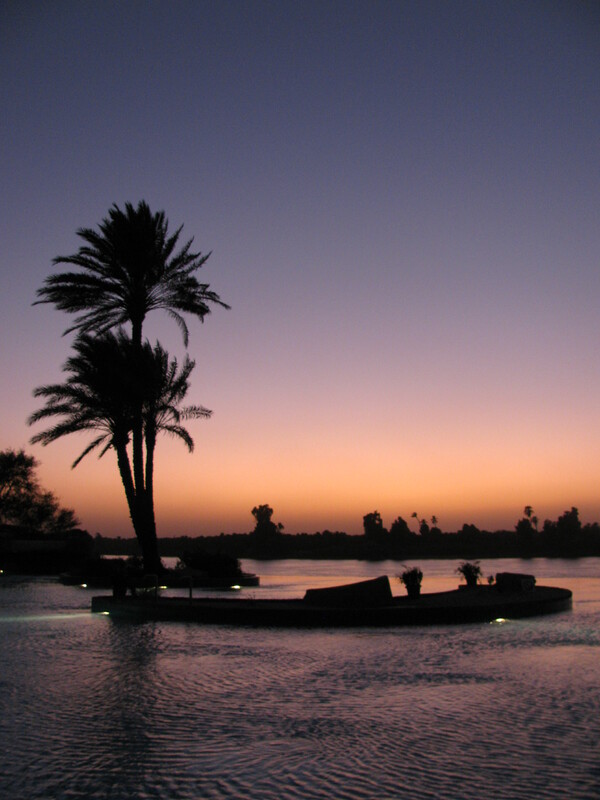 Nothing comes close to the experience of sipping a cocktail while watching the fiery sun slowly slipping beyond the Theban Hills on the West Bank of the Nile. Enjoy! Posted on June 12, 2013 by Fiona Deal. This entry was posted in ancient Egypt, Egypt, egyptian fiction, fiction, History, Travel, Uncategorized, writing and tagged egypt, Howard Carter, Kings Island, Luxor, Mena House, Misr, Nile, Winter Palace. Bookmark the permalink.